The SS Lake Winnipeg was Launched in 1875 and operated by the Beaver Line. She made 48 transatlantic voyages between 1879 and 1898. In this year she was sold to Turkish Owners and renamed Garb. 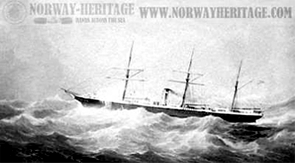 In 1912 the SS Lake Winnipeg was Torpedoed and sunk by an Italian warship. Built 1879; Glasgow by J. & G. Thomson & Co.